Kota Kinabalu is a well-known vacation destination among Koreans. There are more and more Korean tourists coming over to KK for vacation. There are also a sizeable Korean community in Kota Kinabalu and they operate restaurant serving specialties from their country. Here are some of the Korean restaurants in KK. business hour: 10.30am until 10pm daily. Silla Korean Restaurant is a small Korean restaurant at Tanjung aru serving extensive selection of Korean foods. Location: Lot A-G-6, Block A, Ground Floor, Tanjung Aru Plaza, Jalan Mat Salleh, Tanjung Aru. The pork is roasted on open charcoal grill outside the restaurant. The another must try dish is Jokbal (Braised Pig’s Trotters). One of the Korean restaurant which is with halal certified. The interior design of the restaurant is more to fun and cozy. Suitable place for family dining. Each set of the menu comes with Banchan , a side dishes that consist of macaroni, kimchi and vegetable. Chicken king, Toppokki and Bulgogi beef are their specialty. Bintulu Korean Restaurant serve good Korean cuisine food. The restaurant is fully air-conditioned with air ventilation installed on each table as each table is equipment with sizzling BBQ plate. There are two section of the restaurant where the first area is more to usual sitting with table and chairs seating while the second section is Korean-inspired seating, whereby, u need to take off your footwear and sit on the floor to dine. The food specialty there will be the marinated pork such as the marinated pork, marinated pork ribs and honey marinated pork. Each pork dishes costs RM28 and above. 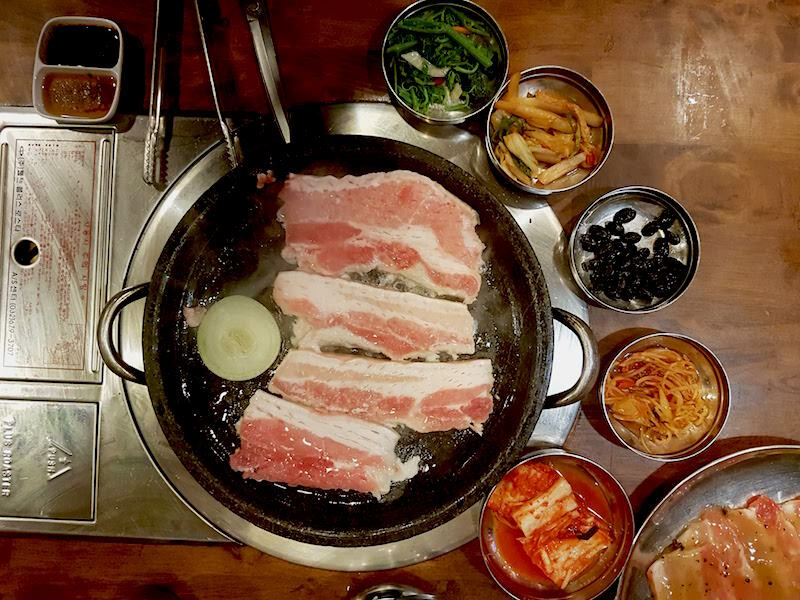 The waiter will help you to cook the pork on your sizzling plate and serve to you. .
Buga Korean Restaurant is located at The Waterfront, behind the BED club. Their operational hour starts at 10.00am until 2.00am. The restaurant is on the first floor and thus, customers can enjoy the view during daylight or night time. The place might be quite isolated as u might need to take the stair to go to the restaurant. They served a wide selection of Korean food choices such as Kimchi soup, Bulgogi, japchae, bibimbap and other more. They do provide lunch menu which consists of side dish and main course meal. 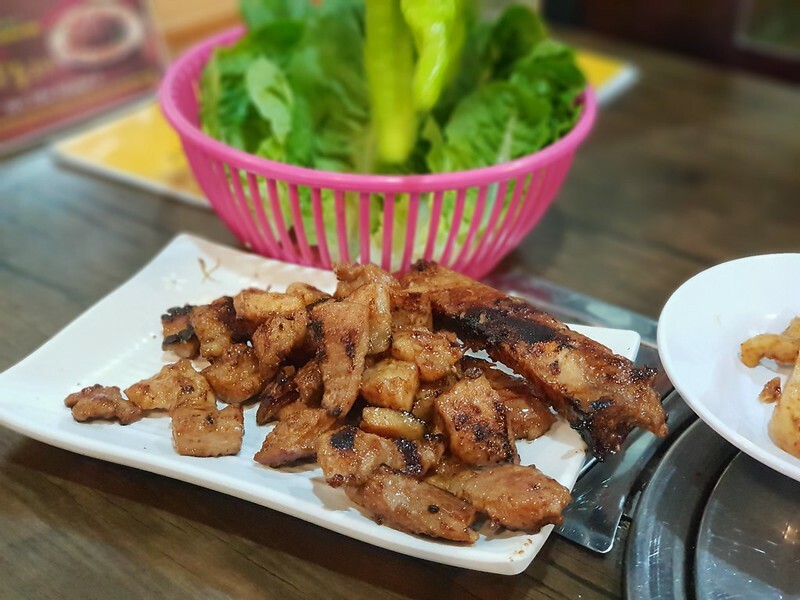 Bab’s Korea BBQ is well-known for its amazing Banchan because they served more than 10 different varieties of appetizers. Customers usually go to Bab’s and order Bibimbap meal which is served in copper plate and costs RM30. Bab’s Korean BBQ might be slightly pricey compared to other Korean restaurants. business hours: 11am to 11pm. Hi Seoul Korean Restaurant was opened since the year of 2008 and still continues to serve their best of Korean food. Although the design of the restaurant are quite simple but the environment there are quite comfortable and suitable for family dining. It is a non-halal Korean restaurant and said that the pork cutlet which is deep fried pork prepared with their special ingredient that will make you wanting more of it. Their menu served several of Korean food for you to suite your teste bud such as steamed dumplings, pork soft tofu stew, seaweed soup and many many more. Apart from that, there is Hi Seoul set meal such as steamboat set meal, rice topped with soy sauce and a lot more for you to explore. The pork there is always highly recommended! It is located at Likas Square, Lot 10 and their business hour starts at 7.00am until 10pm. Koryo-Jeong consider as one of the preferable Korean restaurant visited for both locals and tourist in KK. Koryo-Jeong do serve BBQ grill for their customers and will grill the food in front of their customer. The pork scotch fillet is their best food served there and cost RM28.00. They normally cut-off excessive fat on the pork before grilling it and customers love the smell of the fresh grill pork. It is normally served with bean paste Sause and lettuce. They are located at Warisan Square and business hours starts at 11.00am until 3pm and reopened at 6.00pm until 10.00pm daily. Korean Club Restaurant located in a banglo at Tanjung aru, near to the Tanjung Aru beach and Tanjung Aru Resort & Spa. 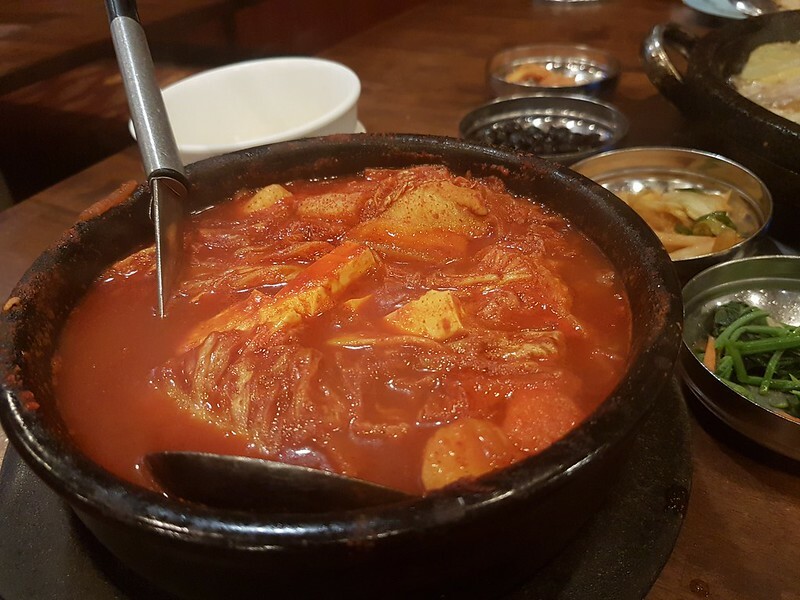 There is another non-halal Korean Restaurant at Karamunsing Capital, called Deli Korea. The owner is a Korean couple. Check it out!